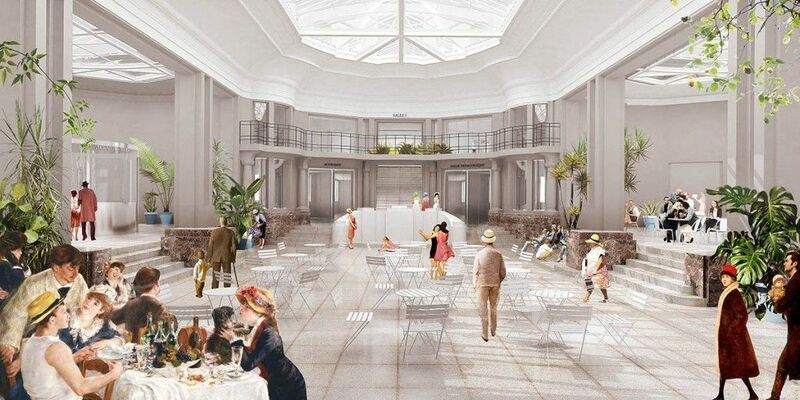 in order to extend and renovate the existing Museum of Fine Arts in Tournai and to propose a masterplan how to integrate the museum more in its surroundings. The existing monumental building, built by the famous Belgian Art Nouveau Architect Victor Horta in 1938, is no longer suited to the onerous contemporary demands for the conservation and display of art. In order to meet these environmental standards much of the architectural quality of the building would be lost (for example; covering the glass roof, insulation of the facades and the introduction of compartments in the plan; ruining the panoptic idea of the museum). XDGA decided instead to integrate the existing building into the public space of the city, as a covered space where different activities of the city and the museum can interact. The new extension inhabits the free spaces around the existing building and integrates parts of it into the exhibition parcours. These new spaces meet the exacting environmental and performance standards required and establish a new dialogue with the character of the Horta building. A higher point in the new extension creates a new definition of the museum in its context.